Do I like trying new Sushi Restaurants? Not usually. Why? Because nothing compares to my favorite spots in San Diego. Go figure, I was in New York City, more than pleased with Sushi Yasuda and have been dreaming about it ever since! It was a night of pure bliss and I will fly five and a half hours to enjoy this experience again along with a dozen other places that I love in The Big Apple. If you’re looking for the typical rainbow, shrimp tempura, and California rolls you will not find them here. It’s not because they have their own selection of specialty rolls, Sushi Yasuda has their own exotic assortments of fish that are hard to find elsewhere, and the fish that you do recognize will be the best you’ve ever had. We sat at the sushi bar, which I prefer because I like to watch the sushi chef’s work their magic. Our experience was most unique. The fish is treated like a delicacy and the chef instructed us on how to devour each one; whether we should dip in soy sauce, top with wasabi, or add absolutely nothing to their simple yet mouth watering creations. My favorites were the Toro Sushi and Arctic Char Roll. If you have a big appetite, the portions are small so be sure to order a miso soup to fill your tummy or better yet hit up a wine and cheese bar afterwards like we did. Casellula Cheese & Wine Café to be exact where they treated us to house made Hazelnut Goat Cheese Truffles. I will leave out the details for another post. 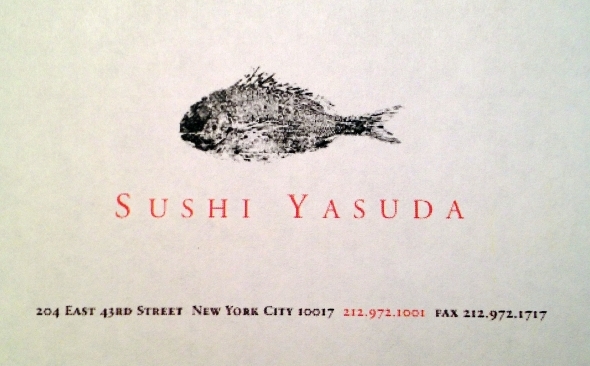 Meanwhile, if you plan on visiting NYC, make a reservation at Sushi Yasuda. It will be a memorable experience and change your sushi palate forever!